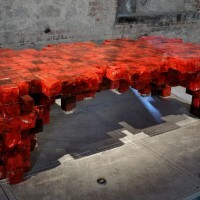 Nucleo, a collective of artists and designers, have created two tables to celebrate the 150th anniversary of the unification of Italy. Nucleo, a collective of artists and designers, is participating in the celebration of the 150th anniversary of the unification of Italy. 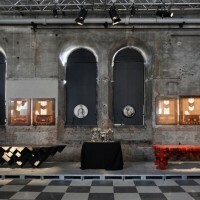 Nucleo exhibits two unique pieces, two tables, at the exhibition ‘Il futuro nelle mani. Artieri domani’ (Il futuro nelle mani. Artisans Tomorrow) at Officine Grandi Riparazioni, Torino. 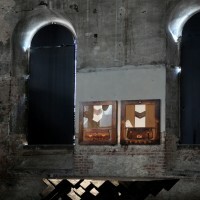 The exhibition is curated by Enzo Biffi Gentili and open between the 17th March – 17th of November, 2011. The Officine Grandi Riparazioni is a fascinating and monumental industrial building complex from the late nineteenth century, originally built for construction and maintenance of locomotives. The two tables represent two distinctive and important features of the creation of the Italian identity. They are inspired by the myths of two organizations that together shaped the history of the unification of Italy. 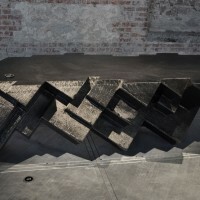 Carboniferous is designed and created by Piergiorgio Robino and Stefania Fersini. 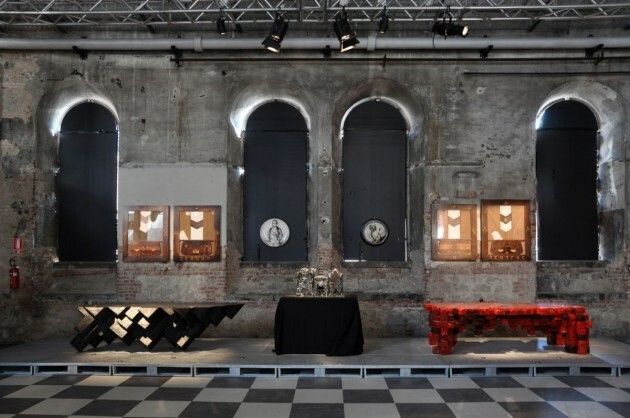 The Carboniferous table is influenced by the illegal congregation of the Carbonari and tells the Italian story of secrecy and conspiracy. 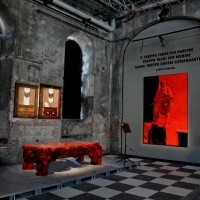 1000 camicie rosse (1000 red shirts), a project by Piergiorgio Robino and Alice C. Occleppo, is inspired by the army of Garibaldi, and interprets the passion and heart, heroism and unselfishness of its members. The power of secret lodges against a brave heart fight, black as opposed to red: two sides of the same, contradictory story. 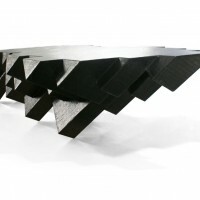 The decision to re-interpret the table as an object is not random. 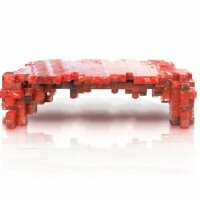 It is an elementary piece of furniture, whose daily use, private and public, declines through countless functions. It is to be found socially and culturally, across all boarders and spaces. It has its home both in gorgeous homes like those in modest apartments and in the secular and religious dining halls, as well as transforming into the canteen ritual, ecclesiastical or temple, that is the altar. It is an object with a strong unifying function, around which a group gathers to compare and explore relationships, domestic or liturgical center of communication and sharing. 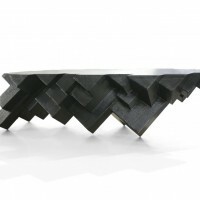 Carboniferous is a table that cuts through space, definite and strong. Its many layer of black surfaces together create a shape, a crystallization of a quick movement, crushing, leading the eye towards the future. The honeycomb cardboard, covered with fiber glass and resin is finished of with layers of carbon fiber. The carbon fiber composes and traces the design, the movement into its unique strength. In Carboniferous you get the feeling that the top surface does not necessarily represent the ideal landing platform. On another perspective the landing surface generates, the powerful and matherical base. Carboniferous is flowing and exploding, like an aggressive wind with a clear direction. As the earth below, coal is extracted into a new form, the result of sediment build-up of plants, so the secrecy and conspiracy of the Carbonari, from underground and from the depth of their hiding places, emerges a few decades later into the tricolore (the three colours of the Italian flag). Coal, a dense network of plant remains, and Italy, a mix of cultures and different latitudes. 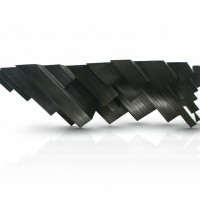 Italian amalgam of different origins, Italy particle edges, Italy multiform, Italy tangle of angles, Italy blunt, concave and convex Italy Alpine wedge, Italy coal. Sediment of a combustion that melted and transfigured particles. It matures in anthracite, increasing its power fuel, or is crystallized graphite, pure carbon with no calorific value, in any sense, Italy is carbonara. 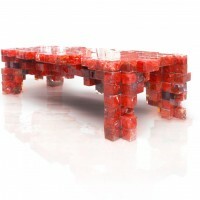 1000 camice rosse, incorporated into a thousand red shirts blocks of resin, a conglomerate of cubes creating a structure without hierarchies, in which each block is simultaneously unique and similar to the other nine hundred ninety-nine. Each cube containing a different shirt, recovered and hue. And what were the thousand, if not the number of grains of a single repeated mantra that repeated, “unity” and “partnership”? In the museums of Risorgimento, you can admire the authentic red shirts, but not without making a discovery: they are all small, like the size of a child, twelve years old. The heroes who made Italy were men one meter and sixty tall, malnourished, they belonged to a land of pellagra and malaria. 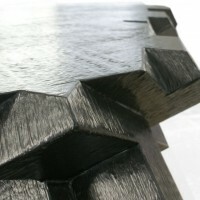 Thus, each module of the table, despite its smallness, it is essential to the overall structure. Garibaldi used red woolen textile that once were worn by butchers to create the uniforms of his men. The shirt itself is a symbol of fellowship with a group. Red is a colour linked to the principle of life, with two different faces: red as associated with the female menstrual blood and the dyad of unfinished life / death, and the red as men linked to the heroic conquest, that mocks death and finds its meaning shading the blood of enemies. And it’s in this red outfit that Garibaldi breaks into history and becomes myth, a legend. Garibaldi gave Italians a new story, a new history, with flavours like courage, unselfishness, pride, decency and a sense of institution. He created an heroic vision, something that lacks in Italy in recent decades. Visit the Nucleo website – here.